Mordian 7th Regiment: Heresy Era Mechanicum - Zhao Arkkad Cybernetica force complete! Heresy Era Mechanicum - Zhao Arkkad Cybernetica force complete! With NOVA bearing down on me, I had to take stock of what remains to be done - As I'd been working on the Castellax recently (who are pulling double duty in both the Thousand Sons and Mechanicum forces) I figured I ought to pull out the rest of the Zhao Arkkad force and get all the waterslides, glossy faceplates and so forth complete. Once that was done it turns out the whole Cybernetica contingent is ready to go! 1500 points doesn't go very far in a Cybernetica force! 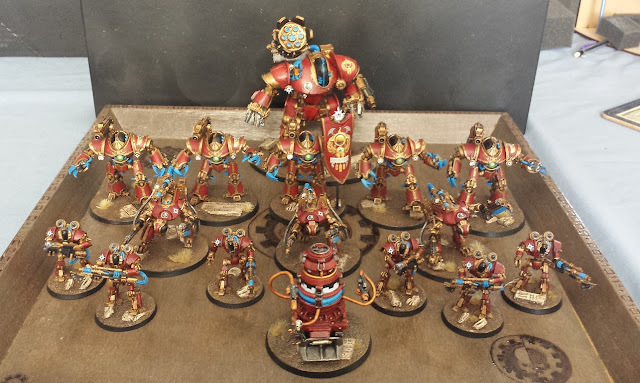 This army will form half of the team game force, and will take the field alongside 1500 points of Thousand Sons. Should be good times! They're currently hanging out on a very cool gaming tray made by the inestimable Zab over at Almost Perftec. Quite happy with how the Castellax Achea turned out - the transfer sheets from Forge World included a couple rather cool banners, and I really dug this one in particular. Added a little touch of the wyrdlight green to help tie them in to the rest of the Thousand Sons force, as they are controlled via a psychic link. Nothing really new with the Thallax, they were pretty much done already and just needed their faceplates given a going-over with the brush-on gloss varnish. 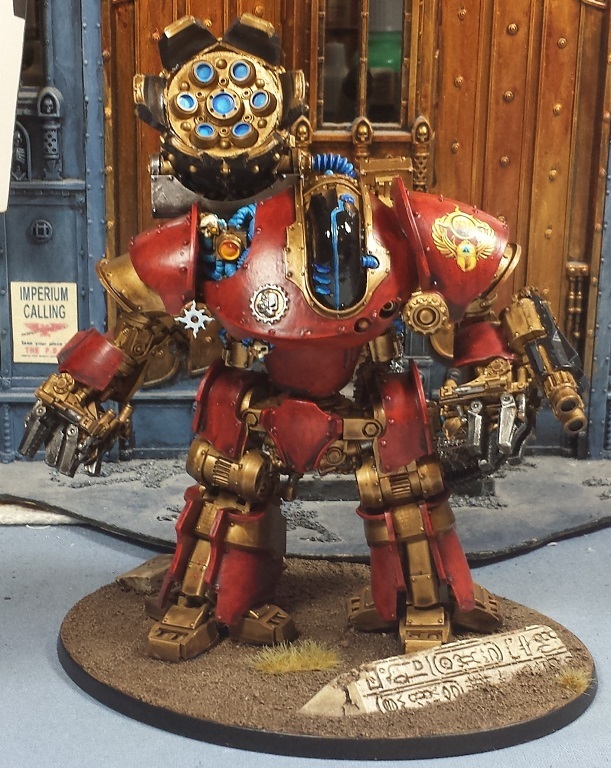 Similarly the Vorax just got the shiny eye treatment, and the addition of a small Thousand Sons nova in white. Helps to tie them in with the rest of the force, all of whom have the white nova on one shoulder or another. Still my favorite of the new robot re-imaginings from FW, I adore these models (fiddly though they are to assemble)! The big guy got a similar large transfer on his shoulder as a callback to the imagery on the Castellax banner, and the shiny faceplate treatment. They're all ready to be packed up for transit to the event! 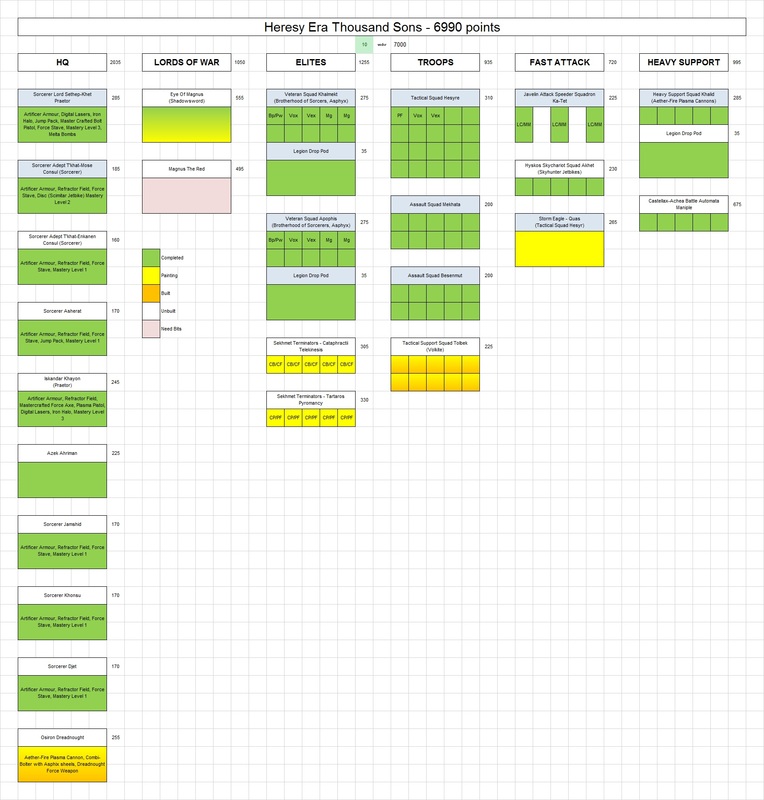 While I was about it I updated the Thousand Sons painting chart. Very close to the finish line now! Trying very hard to stay focused on this project so I don't have to worry about models for NOVA, but have been entertaining thoughts of which project to pick up next - Both the Genestealer Cult and Dark Eldar/Harlequins appeal as a way to dip my toes into 8th edition (which I still haven't had a chance to play), but on the other hand I do really want to start that Sons of Horus army... Decisions, decisions! Nice egyptian bits in the bases, how did you make them? greenstuff? These aren't so cool. So much here to like! That banner is cool! It makes me want to update the old programme rules for robots from back on the day! Awesome work, I love the vorax especially, they are brilliant sculpts. Shiny eyes are creepy. I love it. @Francesc: Hah! It does have a little Dalek to it! The bases are from Elrik's Hobbies, he does several cool ranges of bases! @Col. Hertford: Thanks very much, man! I did love the old flowcharts! @Bronislaw Czevak: Thanks! Indeed, they are just creepy and mean looking! @Riot Ville: The heat of summer does slow me down a touch. Hah! @Monkeychucka: Indeed! The shine really works on the Vorax in particular. Lookong very well, that banner looks just right for the force and all. @Zzzzzz: Indeed, they're just vicious-looking! @#2501: Cheers! That would be cool, beyond my talents but I would think there's room enough in the torso to add lights for sure! @Dave Weston: I appreciate it! Love this work and the vorax are so badass! How did you get this shiny effect on the faceplates??? @leto9fr: Thanks very much! The shiny faceplates is just a brush-on gloss varnish from Vallejo that is applied once the spray matte sealant is done on the rest of the models. Takes a bit of time to dry but ends up super shiny! @Joe B: Cheers Joe! 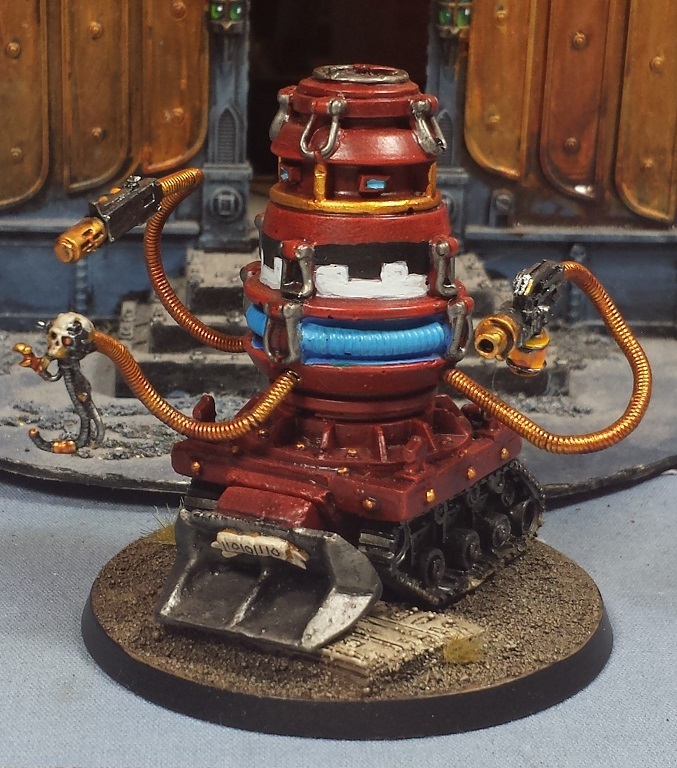 Amazing how few models you get for 1500 points with a Mechanicum force! Great work as always - and I'll echo what leto9fr said, that varnish is really nicely done. @Colonel Scipio: Thanks very much, man! I rather enjoy the super glossy effect!